Author Julie McKay Virginie Degorgue. 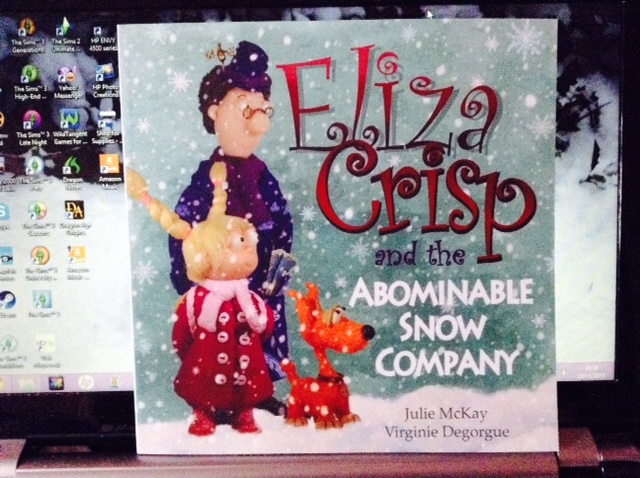 I read Eliza Crisp And The Abominable Snow Company with my cousin yesterday. This book is very beautifully presented. The pictures are nice and clear to look at and the wording is set out really well. My cousin had very little trouble reading this book because the words are mostly written in a simply and fun way. He also loved the fact that after reading this book it actually snowed here so he believes in the Berty the abominable snow company creature. And now what a snow globe of his own to tell the weather with just like Eliza Chisp did. The book itself is about Eliza, Amy and Frazzle the dog as they go to the South Pole in a hot air balloon to find out what happened to the Snow, as Eliza snow globe indicated it should be snowing by now in England. When they get there they meet Berty from the abominable snow company who they ask to help find out what happened to their snow. And if they would be able to still get snow in time for Christmas. My cousin loved the part about if the cat sits on the fridge it will mean it will be very cold outside. My Smokey got followed a bit after reading this book. Also he did like the images of Berty and the talk about the different types of snow. I think this book age range 5-8s is about right for this book, although I think younger children might enjoy it as well. This is another book I would read to my nieces if they were a little older. If you want to give this book a go you can buy it on Amazon. ← Twenty Four Days To Christmas Author Fred Arthur. This sounds like a fun kids’ book, Katie. Thanks for sharing your review! It was a fun kids book and read just in time for our first snowfall. 🙂 Which inspired my cousin.